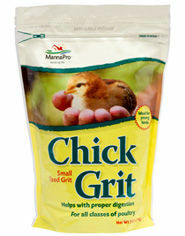 POULTRY CHICK GRIT 6x5 LB. Chick Grit has smaller particles, to help you get the same great benefits of Poultry Grit but in an easier-to-feed size for young and bantam-sized birds. Helps with proper digestion. Small-sized grit for young and bantam-sized birds. Feed to young birds beginning at two weeks of age. Monitor intake of Chick Grit for the first few days. If consumption is excessive and causes a reduction in feed intake, limit access to Chick Grit. Chick Grit is also suitable for adult poultry and fowl.